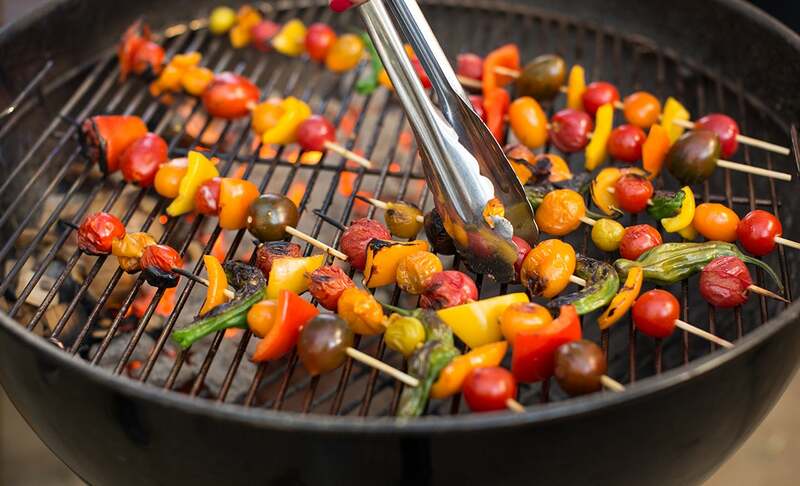 Bring amazing flavors to vegetables by barbecuing them over Kingsford® Charcoal. Barbecued vegetables not only taste great, but they make every BBQ look better. One of the highlights of any barbecue is a large, colorful platter of barbecued vegetables. Here are some handy tips for barbecuing vegetables using Kingsford® Charcoal. The key to cooking most vegetables on the BBQ is to lightly coat them in vegetable or olive oil. It prevents them from sticking on the BBQ and drying out, enhances grill marks, and allows seasonings to adhere better. Unless otherwise noted below, coat all vegetables in oil before barbecuing and season with salt and pepper. When the coals are ready, clean, preheat, and oil your BBQ grates. Barbecue the vegetables directly over the coals on a medium-hot [two-zone fire], moving the cooked vegetables to the cooler side of the BBQ as the others finish. In the husk or out? Everyone has an opinion on this popular BBQ favorite. Both work, but removing the husks and silk is the way to get grill marks, caramelization and smoky flavor — all the things you love about barbecued food, right on the cob. Set up a medium hot two-zone fire. Remove the husks and silk from the corn, brush the corn with vegetable oil, season as you like and place it directly over the coals, turning often to cook it evenly and prevent burning (about 10 to 13 minutes total). Barbecuing the corn in the husk provides more of a steam cooking. Learn how, here. Slice off the artichoke top (about ¾ of an inch) and steam in a pot until tender but not overly soft. 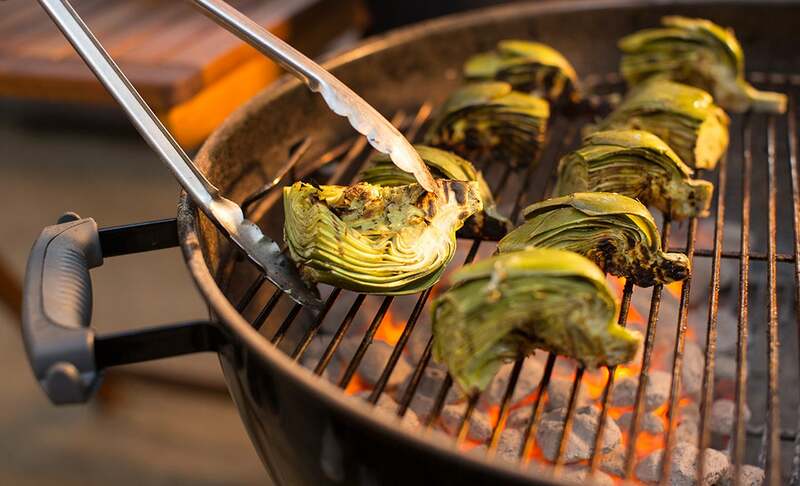 Then, using a large knife, slice it in half from top to bottom, place it over the coals, and barbecue until the inner side of the leaves are tender and the outer part of the artichoke is lightly charred. 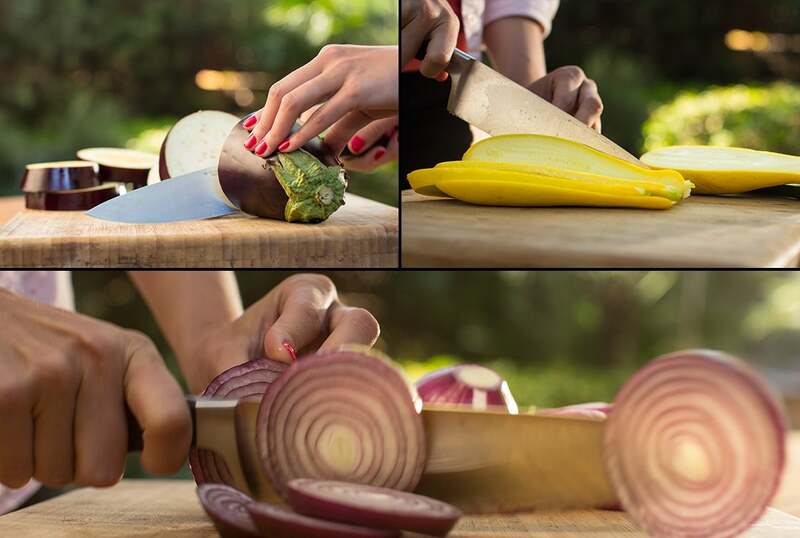 The easiest way to barbecue rounded vegetables such as onions and eggplants is to slice them into ¼- to ½-inch disks to increase the surface area (for elongated vegetables such as squash, bell peppers, and zucchini, slice them lengthwise). Turn two or three times while barbecuing, and remove when tender and lightly charred. The most common method of barbecuing small mushrooms is to skewer them or place them in a barbecuing basket. 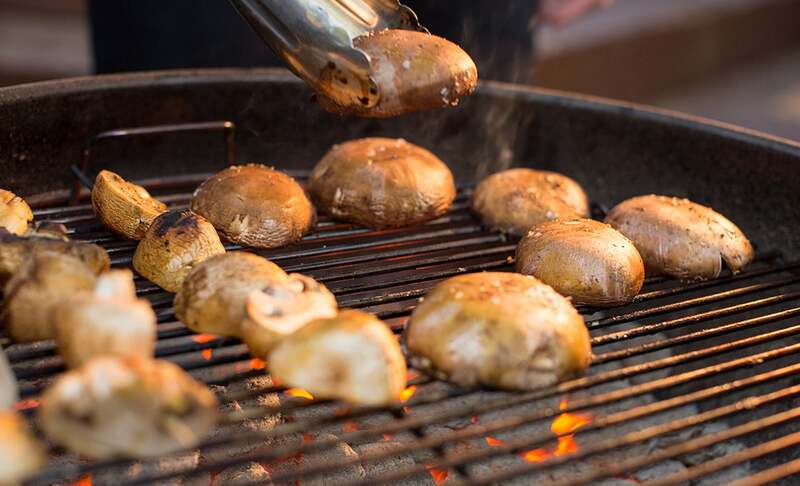 Large mushrooms such as Portobello mushrooms can be barbecued directly on the grate. Remove the stem, place the cap over the coals, and flip it two or three times until tender and charred—about five minutes for smaller caps and eight minutes for very large ones. First, trim the woody bottoms from the stalks. Place the stalks directly on the BBQ (perpendicular to the grate) and cook until just tender but not mushy. 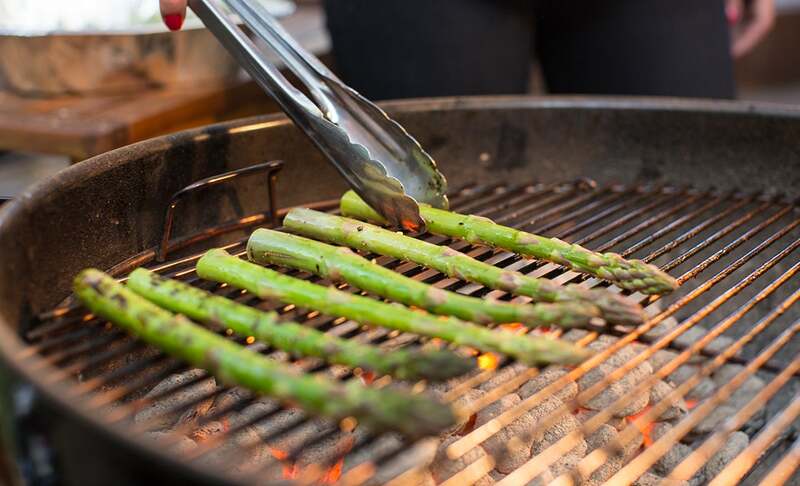 Asparagus cooks quicker than most other barbecued vegetables, so be sure not to overcook them. Small tomatoes such as cherry tomatoes are best barbecued on a skewer. For larger tomatoes, trim the ends off, slice the tomato in half, and barbecue with the flat side down. Barbecue tomatoes briefly so they don’t get too soft. Since grilled vegetables taste great at room temperature, you can cook them first and set them aside until you’re ready to serve the entire meal. Woods infused with fruit flavors such as cherry, peach, apple, pear, and pecan are best for adding smoke flavor to grilled vegetables. Avoid strong-flavored woods such as hickory or mesquite. The key to getting good grill marks is to not move the oiled vegetables too frequently once they've been placed on the grate.